In 2000 INAH convened the 2nd Teotihuacan Round Table with the proceedings published in 2004. Christopher A. Pool (University of Kentucky, Anthropology) and Wesley Stoner (University of Arkansas, Anthropology) presented at the round table and their paper was included in the proceedings. Their paper is entitled "El Fenomeno Teotihuacano en Tres Zapotes y Matacapan: Una Discusion Comparativa." They reference Teotihuacan, of course, and the three major Teotihuacan-influenced sites in the Tuxtlas. Tres Zapotes, Matacapan, and Piedra Labrada all show significant Teotihuacan influence, with that influence strongest at Matacapan. Matacapan was probably the site from which Teotihuacan influence spread throughout the Tuxtlas. The classic period Matacapan was founded after AD 300. Between AD 300 and AD 450, Matacapan extended over approximately 50 hectares. 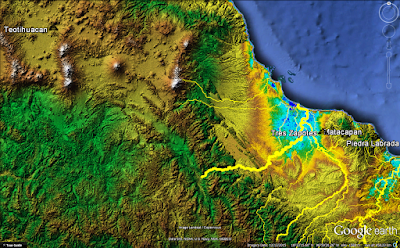 In the terminal formative period (0 BC - AD 200) Matacapan was covered by a thick ash layer from a volcanic eruption (Nixtamalapan) that caused the site to be temporarily abandoned. Soon after AD 300 immigrants from Teotihuacan settled in Matacapan and began manufacturing pottery that was a fusion of local material & technology with Teotihuacan style & iconography. During the AD 300 - AD 450 time period, green obsidian from Pachuca, Hidalgo (an obsidian source under Teotihuacan control in that era) was present at Matacapan. 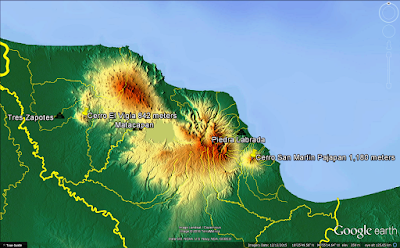 Between AD 450 and AD 650 Matacapan grew rapidly, extending over approximately 700 hectares. Between AD 650 and AD 800 Matacapan diminished in size to approximately 460 hectares. The site was abandoned ca. AD 800. Teotihuacan influence at Matacapan reached its zenith between AD 450 and AD 550. Between AD 300 and AD 450, Matacapan had a much stronger relationship with Teotihuacan than it did with neighboring sites in the Tuxtlas. After AD 450, even as Teotihuacan stylistic influence became more pronounced, Matacapan began developing strong ties with their neighbors. Tres Zapotes was an Olmec site that continued into the epi-Olmec period (300 BC - AD 200). 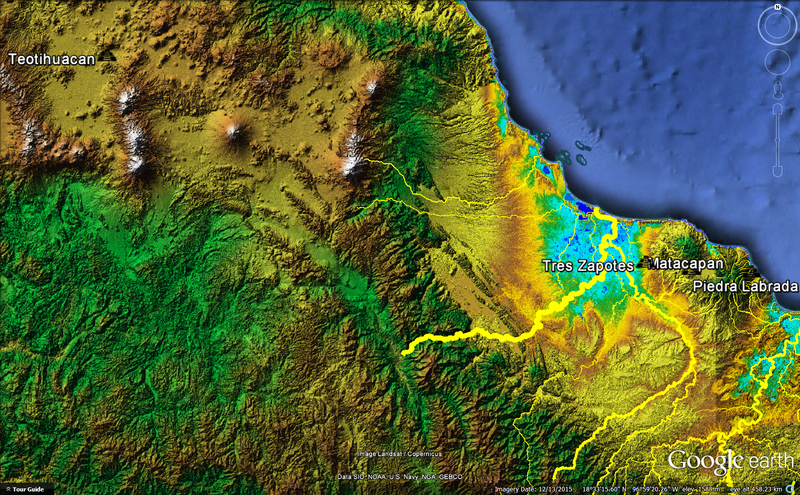 Between AD 300 and AD 600 Tres Zapotes experienced a dramatic decline in population after a volcanic eruption (ca. AD 200 - 300) covered it in a thick ash layer. This was a different volcano than the one that covered Matacapan 100 - 200 years earlier. Even though it is only 30 kilometers west of Matacapan, Tres Zapotes was not abandoned in the 0 BC - AD 200 time frame like Matacapan was. 855 obsidian artifacts were recovered from Tres Zapotes by Drucker & Weiant in their excavations reported in 1943. 4,155 obsidian artifacts were recovered from Tres Zapotes by Pool & Stoner in their 1995 - 1997 excavations. The obsidian Pool & Stoner found at Tres Zapotes was dated strati graphically with the following results: 1,328 pieces in the late formative (500 BC - 0 BC), 1,092 pieces in the terminal formative (0 BC - AD 200), 720 pieces in the early classic (AD 200 - AD 450), no pieces in the middle classic when the site was in serious decline (AD 450 - AD 600), and 638 pieces in the late classic (AD 600 - AD 900). If the land of Cumorah and hill Ramah/Cumorah were in the Tuxtlas, as we propose, there are some potentially striking Book of Mormon correlations with these data. The eruption of Nixtamalapan that covered Matacapan with ash may correlate with the destruction in the land northward reported in 3 Nephi 8:5-23. Teotihuacan may be the great city, Jacobugath, in the northernmost part of the land, inhabited by Gadianton robbers 3 Nephi 7:12, 3 Nephi 9:9. If Teotihuacan was the robber capital, that explains why Mormon was fighting a two-front war against the Lamanites coming up from the south and the robbers coming down from the north Mormon 2:27-28. It also explains why Mormon and the Nephites could not simply continue retreating northward out of harm's way, and why survivors of the holocaust at Cumorah fled southward Mormon 6:15. Hill Shim is probably in the same general vicinity as hill Ramah/Cumorah. Ammaron was inspired to hide the Nephite repository in hill Shim, and he fully expected it to remain their securely until the latter days 4 Nephi 1:48-49. He explicitly told Mormon that he had deposited the Nephite records unto the Lord, and that Mormon was to remove the plates of Nephi, but leave all the other records in Ammaron's repository Mormon 1:3-4. If Cerro Vigia was Shim and Cerro San Martin Pajapan was Cumorah as we suggest, that explains why Mormon expressly disobeyed Ammaron's instructions and moved the Nephite archives from Shim to Cumorah Mormon 6:6. Teotihuacan's abrupt presence at Matacapan after AD 300 dramatically changed the balance of power in the western Tuxtlas in favor of the enemy. A previously underpopulated place suddenly became a stronghold. This map shows the 3 sites in the Tuxtlas with Teotihuacan influence in relationship to our proposed hills Shim and Ramah/Cumorah. Tres Zapotes, Cerro Vigia, and Cerro San Martin Pajapan were all Olmec sites during the Jaredite era. The presence of obsidian in quantity at Tres Zapotes in the late formative works well with the Jaredite warfare narrative in the book of Ether. The rapid expansion of Matacapan after the pesky Nephites were eliminated ca. AD 385 fits well with known relationships between Teotihuacan and virtually all of southern Mesoamerica at this precise time period (for example, the famous "entrada" at Tikal in AD 378). Significant Teotihuacan presence at Matacapan from AD 300 - 385 makes a Cerro Vigia - Ramah/Cumorah correlation a la David A. Palmer & John L. Sorenson highly problematic from a strategic military point of view.